Having a new baby is a lot of work, and there isn't much reward at this age. While Charlotte is developing every day - and a good baby in general, her progress is slow and she doesn't really give a lot of positive feedback. So far, I find it a lot easier to take care of a baby with a toddler around. Daniel is so much fun at this age, that I get a lot out of just watching him. And this makes a big difference to my days spent alone with a baby. 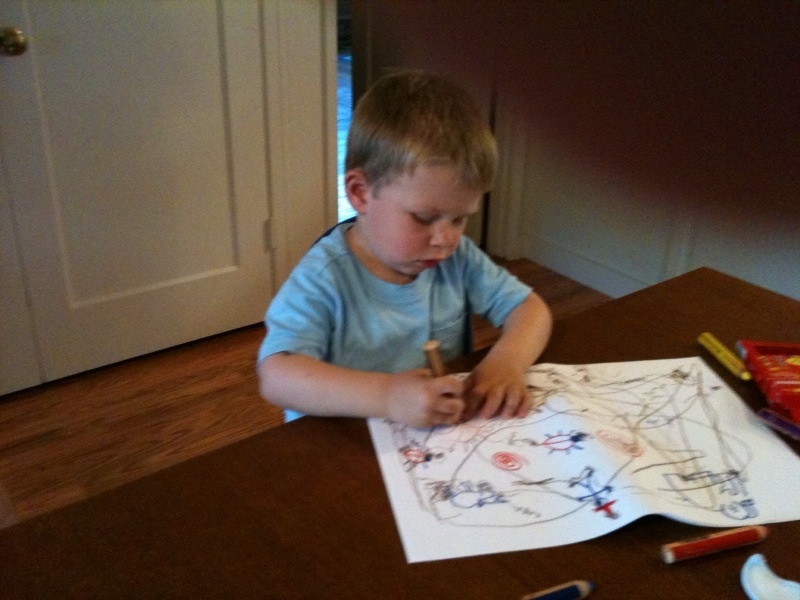 For instance, we discovered that Daniel had made a lot of progress with drawing. Not only can he draw a couple of shapes by himself, but he is really good at concentrating now. He tries really hard to draw what he plans to do. It's really fun and interesting to watch. We can have discussions about the stories he is laying out. This is such a fun interaction. Also, the other day, we were watching a kid movie where the main character was sad and frustrated. It was interesting to watch how Daniel kept suggesting that the character should go to his daddy... I guess his assumption is that Daddy can make things a lot better when you are not doing well. How cute! Finally, on the big brother front, Daniel has been great so far. He gets very excited when Charlotte wakes up, and he pays a lot of attention to what she does, asking a lot of questions (it also turns out that he is in the "why" phase, so he applies it to his observations about Charlotte). He is also very protective of his little sister. When people approach us to look at her, he always want to make sure they are nice to her. 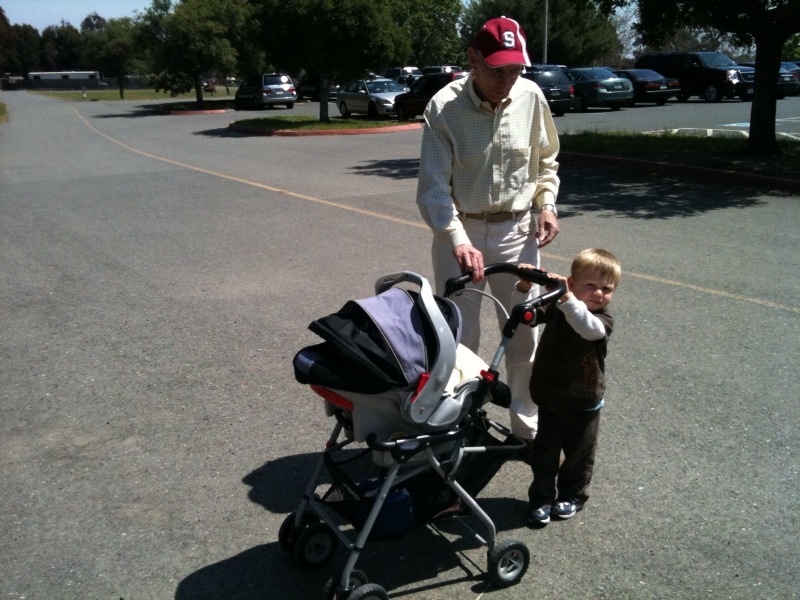 He also makes a point of pushing her stroller when we go out... So nice! We still have to teach him to be gentle. Daniel wants to help her, but patting on the back or offering the pacifier sometimes takes the form of pushing things on his poor baby sister. I know he will be able to learn it, and hopefully, he will continue to be a caring big brother. My name is Isabelle. I was born and raised in France, but have always been interested in visiting new places. In the late 90s I lived in Germany for 4 years and I met my husband there. I have been living in the San Francisco Bay Area since 2001. Our son was born in January 2008 and our daughter in April 2010. We are trying to raise them with 3 languages. This promises to be an interesting challenge. Professionally, I have been working in online retail for most of my career ... I love shopping, so this is a perfect fit. My focus is on Online Marketing and Customer Relationship Management, quite important areas for online retail since competition is always one click away. Mom Fuse Mom Blog Directory!